Bolton Landing, located on the shore of Lake George, is a popular destination for both tourists and locals. In addition to its beautiful beaches and views, Bolton Landing is the home of the famous hotel The Sagamore, the high-flying high-wire adventure course Adirondack Extreme, Highlands Castle where fairy tales come true, and so much more! Bolton Landing is a hamlet in the Town of Bolton, both of which are rich in present day attractions as well as in history. The history of the Town of Bolton dates back to 1799, when it was formed from the town of Thurman. 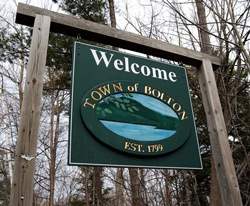 According to town descendent Arabella Nims, the area of Bolton Landing in the early 1800s was comprised of mountains and valleys that were covered with trackless forests. During that time, there were only four or five framed houses, with the majority of housing constructed from logs. When Bolton was first established, the primary industry was lumbering which brought a number of saw mills and grist mills to the area. In the beginnings of the town, there was only one school house that was located three miles north of the town, until around 1804 when a new school was built south of the historic Mohican House. Today, the town has its own school district, the Bolton Landing Central School District. The Mohican House was the site of the very first hotel, tavern, and general store in Bolton Landing. Built in 1870, the second oldest hotel in Bolton was the Bolton House, located north of the Mohican House. The third oldest hotel is the famed Sagamore, which first opened in the spring of 1883. The Sagamore, situated on Green Island, is proudly running today, and stands on higher ground overlooking the majesty of Lake George. Built in 16th century style of architecture, the Sagamore offers spectacular views of the Adirondack Mountains and the lake, as well as wonderful accomodations and delicious food. Come relive the past in Bolton! When visiting, be sure to check out the Bolton Historical Society Museum and Lake George Historical Association Museum for exhibits and more historic facts about the town.